The Testing Center for Large Structures provides facilities for investigating various performances of structures. It is equipped with a Large Structure Testing Apparatus, Test Floor, Multiple-excitation Shaking Table Test Apparatus and Outdoor Testing Fields. The Large Structure Testing Apparatus has a capacity of 30-MN compressive loads and 10-MN tensile loads. The testing area has a maximum compression span of 10 m, maximum tension span of 8 m, and a maximum flexural span of 20 m. Strength tests can be conducted for structures with a size close to full scale. 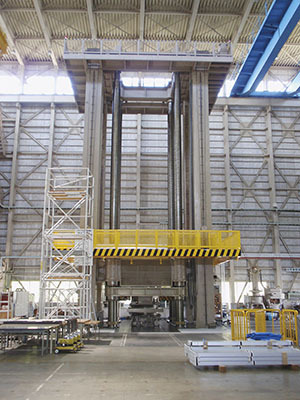 The test apparatus has the largest capacity in Japan. The Test Floor is composed of 12-m-high reaction walls and reaction floors. Vertical load tests and horizontal cyclic load tests can be conducted for various types of structures. For investigating the seismic behavior of structures during an actual earthquake, or observing the behavior of structures subjected to dynamic loading, dynamic test apparatus such as the Multiple-excitation Shaking Table Test Apparatus and Fatigue Test Apparatus can be used. The Outdoor Testing Fields provide a testing environment that can be used for a wide variety of purposes including the construction tests of structures, and production and assembly of specimens.